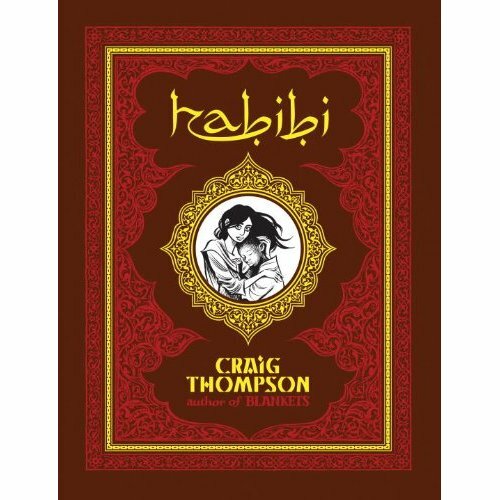 Habibi, by Craig Thompson, is out. Progress reports have been coming up on his blog for an age and a half, taunting us with these gorgeous, intricate images and all the stages of the publication process. I read his Blankets a few years ago (and had to save up for the privelage, my local library isn't big on comics) so I'm really looking forward to this. It shall be mine. Oh yes, it shall be mine. 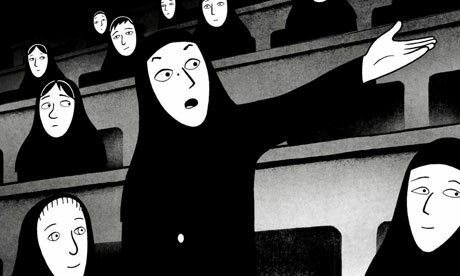 Also in the news today, the animated adaption of Marjane Satrapi's comic duology Persepolis has been causing fights and court cases in Tunisia. The comic was ground-breaking enough in the West, giving us a personal look at life during the Iranian Revolution through the eyes of a young Marjane, but closer to it's home it's even more challenging. The animated movie was shown on television in Tunisia, and includes a scene where Marjane speaks with God, who is portrayed in the classic white-and-beardy-and-fifteen-feet-tall fashion. For us and for her it seems like an obvious way to show the kind of relationship she has with her creator, but for most conservative Muslims showing any image of God or Mohammed is a massive no-no. The TV broadcasting station came under attack and is currently on trial for "insulting sacred values". Anyone care to suggest that cartoons are only relevant to kids? No, I thought not. We're so used to being allowed to say whatever we think or believe in Britain (and sometimes we say too much as a result) without life-threatening consequences that the idea of a country where showing a programme that contravenes one such belief results in out-and-out violence (thereby contravening other beliefs about love and peace in that same religion, one would think) is frankly very bizarre to me. It seems almost backward, and I want to make indignant statments that begin with "How can it be, in this day and age...? ", as if people now are any less impulsive and fearful than they have always been. As a Christian I get crossed by people every other day, promoting beliefs that can directly oppose mine and sometimes be very offensive to me, but I don't get to go attack a TV station and I wouldn't expect to be able to either. Beating someone to a pulp is no way to convince them that they were wrong, just to set them against you even more. It's a bit like that time they put Nick Griffin on Question Time; it was right to give him the freedom to express his ideas... and equally right that he was immediately shot down by the rest of us for being a narrow-minded nationalist muppet, but no one commited arson on his office over it. Besides, we're British, we don't attack broadcasters, instead we stoically stiffen our upper lips and join the queue to the complaints booth.